Q&A with Joanna Penn of The Creative Penn, author, entrepreneur. 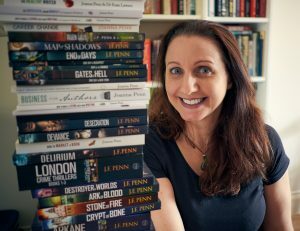 Joanna Penn is an award-nominated, New York Times and USA Today bestselling author of thrillers under the name J.F.Penn. She also writes non-fiction guides for authors. She’s an award-winning creative entrepreneur, podcaster, and YouTuber. Her site TheCreativePenn.com has been voted in the Top 100 sites for writers by Writer’s Digest. Joanna was named Publishing Commentator of the Year at Digital Book World 2018. She lives in Bath, England and enjoys a good gin & tonic. Tell us a bit about yourself and The Creative Penn: what inspired you to found the website and help others publish their own books? Back in 2005, I was living in Brisbane, Australia, working as a business consultant implementing Accounts Payable into large corporates. I was highly paid, but I was miserable. I had all the trappings of a successful life, but I couldn’t see the point in what I was doing. Like many of those who fall into a career after university, I questioned my whole direction. I started to read self-help books, listened to audio programs and went to events that encouraged me to take control and change my life. So I decided to write a book about how to change career, with the hope that in learning how to help others, I would also find my own path. That book eventually became Career Change: Stop hating your job, discover what you really want to do with your life, and start doing it!, which I rewrote and re-issued in 2012 after leaving my job to become a full-time writer. When I finished that first book in 2007, I looked at the publishing industry and discovered how long it would take and how many hoops I had to jump through to get my book into the world. I’d been running my own business for years at that point, so I decided to do it myself. Then I proceeded to make all the publishing mistakes under the sun! I was ripped off by an author services company, and I ended up pulping nearly two thousand of my own books. I also discovered that books didn’t sell themselves and I knew nothing about marketing. But those mistakes drove me to write about my lessons learned and I started TheCreativePenn.com in 2008 in order to share my personal journey. That was a pivotal time in publishing and in the internet business. The iPhone and Kindle launched in the US in 2007, and I was one of the first people in Australia to get the international Kindle in October 2009. The price of paperbacks was way too high for a bibliophile like me, so I swiftly moved into reading digitally. As a reader, I was able to buy five times as many books for my money, and as an author, I was now able to reach the US market by publishing direct with Amazon KDP. As I’ve continued to share my author journey over the last 10 years, the publishing industry continues to shift. I now have 28 books (fiction and non-fiction), selling in ebook, print and audiobook formats. I’ve sold over 500,000 copies of my books across 86 countries and five languages, and I run a multi-six-figure business as an author-entrepreneur. I don’t publish other authors, I just continue to share my journey and lessons learned through my books, blog, podcast, courses and public speaking. My goal is to empower writers and help them understand that this is the best time ever to be a creator. We live in exciting times! What is the most valuable thing you’ve learned since launching The Creative Penn? At that point, I was not creative and I was not an author. I couldn’t even read those words out loud. But by taking action every day towards my goal, learning, reading, trying things, pivoting and being clear about my future, I achieved that first goal. More than that, I changed the direction of my life. The world of the creative entrepreneur is all about setting goals and then trying new things in order to achieve them, because change is the only constant. New tools, new opportunities, new connections, new markets open up every week and by trying them out and staying nimble, I’ve been able to take advantage of them. For example, I was one of the first international authors to self-publish an ebook on the Kindle, I started a podcast in 2009 before the podcasting boom, and I was one of the first indie authors to have an audiobook for sale through ACX (Audiobook Creation Exchange) in the UK. So the lesson is to keep learning, keep experimenting, keep pushing the boundaries of what others say cannot be done. What is your experience of self-publishing? Could you tell us if and why you prefer this approach over traditional publishing? I don’t call myself a self-published author. I’m an independent author – an indie – in the same vein as those indie musicians and indie filmmakers who choose to create away from the blockbuster Hollywood or music label model. Self-publishing is also a misnomer as I don’t do everything myself. I write the books myself and Curl Up Press, my imprint, publishes my books all over the world, but I work with professional editors, cover designers and formatters as well as using virtual assistants and other freelancers. I use the same online marketing tools as any publisher – Facebook Ads, AMS, Search Engine Optimised content marketing, podcasting, and social media. I chose the independent route from day one – even before the incredible publishing opportunities we have today. It’s always been first choice for me, because I’m a businesswoman. When I saw the margins I could make by going direct to distributors and marketing directly to readers, I knew that I could make a good living as a writer as well as finding meaning in my life. As a result, I left that consulting job in 2011, when we also moved back to the UK. Yes, I am creative and I am an author first, but the artist in me is only one side of the equation. The other side loves commercial success and really enjoys making excellent money! I subscribe to the Picasso model, the wealthy creative, not the ‘poor-author-in-a-garret’ story. I love to create and then exploit my intellectual property rights in as many ways as I can. In that sense, I have a lot in common with business-minded publishers. As for preference, I have never had a traditional publishing deal in the English language. I do have some foreign rights deals which I’m happy with, but those are time-, territory-, and format-limited. Whenever I consider pitching to an agent or publisher for English language rights, I hear about contracts that license for the term of copyright, in all formats, in all territories, for less money than I can make myself. As a businesswoman who understands intellectual property, I know why that is, but my creative entrepreneurial side sees so much opportunity ahead that I prefer to exploit those rights myself. But never say never, and I would absolutely consider working with an agent who truly wanted an entrepreneurial partnership, and a traditional publisher who was interested in licensing rights they would actually exploit within a reasonable time-frame. As ever, it comes down to what you want to spend your time on. I measure my life by what I create, so my focus is on writing, getting my books into the world, reaching readers and empowering authors, not chasing a traditional deal. Not all authors want a business like mine, so happily there’s room for all of us. It’s a thriving time in publishing with more than enough room for all kinds of business models. You were inspired to learn more about marketing after self-publishing your first book in 2008. Could you tell us a little about your experience of marketing, and growing your business independently? When I published by first book, I took delivery of several thousand print books which sat in my front room and glared at me every night when I got home from work. The euphoria of publishing soon wore off when I realised that the books wouldn’t sell themselves. Like many other authors out there, I had no desire to learn marketing at first, but those books shifted my mindset and I devoured books and courses on marketing, then put the tips into action. I started with traditional PR and media, and I made it into national papers and onto national primetime TV, but I still wasn’t selling any books. Then the Kindle launched, I discovered print-on-demand and internet marketing, and my life changed! I started the blog, an email list, and a YouTube channel in 2008, then the podcast in 2009 and I also discovered Twitter where I was able to (finally) meet other entrepreneurial authors across the world. I was still living in Brisbane at the time, but I knew that the market of readers in the USA was over ten times that of Australia, so I was determined to sell to that market. I learned about internet marketing, which suited me geographically, but also as a personal preference as I’m an introvert. I like being at home in the quiet, rather than out there meeting and greeting. Using these online methods, I started to sell more books, and I could see how the business model would scale through ebooks, print-on-demand, and digital audio. That’s basically been my model ever since. I still blog, podcast, YouTube, use Twitter (and other social media), I connect with readers and other authors online – and of course, I write more books and get them out there in every format, on every platform, in every country I can. In terms of growing an independent business that is sustainable for the long-term, my business model is all about multiple streams of income. I was laid off from my job in 2008 during the Global Financial Crisis and swore that no single company would ever have that much power over me again. I have maintained that outlook and even Amazon sales make up only 11% of my company revenue these days, which probably makes me more independent than most traditional publishers. My latest thriller, Valley of Dry Bones – book 10 of my ARKANE thriller series is out soon, so I’m finishing up the various launch tasks. The indie author model is more about long-term sales rather than short-term spikes, but I still need to do email blasts and ads etc. I’m doing a hardback edition this time as well as ebook, print, large print and audiobook, so it’s interesting to learn what that means for extended distribution into libraries and other print markets through Ingram. I start researching for my next Mapwalker dark fantasy thriller in December in New Zealand, and I’ll also be recording my first short story in audio next month. I’m fascinated with the #voicefirst movement and as a podcaster, I know the importance of voice for growing a brand. In 2019, I’ll be launching a new website and over-arching brand aimed at using content marketing to sell fiction. It will integrate a new podcast and audiobooks, and represents the beginning of my next 10-year project. Of course, I’ll be continuing to empower authors at TheCreativePenn.com, but I’m also ready for a new challenge. Still goal-setting after all these years!